The crafting system in Tom Clancy’s The Division allows you to create new items like weapons and gear, or improve and customize your equipped gear by using different types of Crafting Sources. These new items can be crafted at the Crafting Station which is located in your Base of Operations. 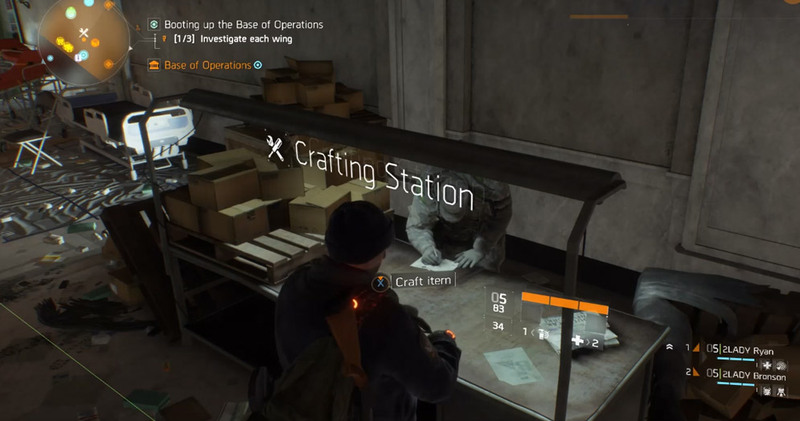 Although you will find better and better loot as you progress in the game, crafting becomes an essential part in case you want to get the maximum out of your gear and survive in higher contaminated areas as well as against stronger opponents, whether it’s against NPCs or real players in the Dark Zone. In order to be able to craft an item, a proper Blueprint is required. Crafting Sources drop randomly and can be looted from enemies and corpses, or found in crates as well as other places in the city that indicate a specific crafting material location. These locations will reset every 2 hours so that you can revisit them and grab the materials again. Furthermore these materials are based on the item qualities and therefore are an indicator for how good the crafted end-product can be. Material Conversion blueprints allow you to create a new material by spending 5 of a certain quality to get the next higher one (e.g. 5 Specialized Weapon Parts for 1 Superior Weapon Parts). Fabric is used to create gear and gear mods. Weapon parts are used to create weapons and weapon mods. Tools are used to create weapons and weapon mods. Electronics are used to create gear and gear mods. 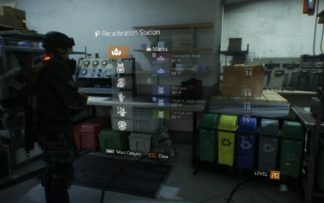 Division Tech material is used to create gear, gear mods, weapons and weapon mods in Dark Zone blueprints. Blueprints tell you exactly what items can be crafted and how many crafting sources are needed to fulfill the requirements. 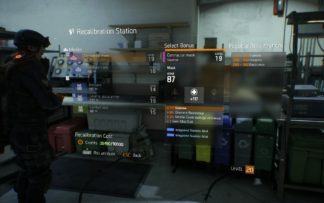 They can be found throughout the game and are furthermore divided into normal blueprints and Dark Zone blueprints, while latters one can be only found in the DZ and are the best in the game. The Recalibration Station allows you modify the bonuses and attributes of your gear. It can be unlocked via the Recalibration Upgrade in the Tech Wing and is located in the first floor of your Base of Operations. In exchange for some currency, you can re-roll one property of your gear piece with another random property in the same category. For example if your item has got a Firearms stat, the possible list of recalibrations will consist of Firearms, Stamina and Electronics, each with random value ranges (min. and max.). Choose wisely and be careful at this point, because once you have selected and recalibrated a property this will be the only one you can modify again, at a higher cost with each try. Weapon Kits and Phoenix Credits are required in order to be able to re-roll a Weapon Talent on your weapon. A Weapon Kit can be either obtained through a normal loot drop or by crafting it with any High-End material. You can recalibrate a gear item or Weapon Talent up to 6 times before the ability to do so gets disabled. Before you want to get rid of one of your items – whatever the cause might be, you should think about if it wouldn’t be worth to deconstruct it. Items can be deconstructed into crafting materials and the higher its quality, the more valuable the outcome. Keep in mind though that deconstructing or dismantling of your item destroys it which cannot be undone.